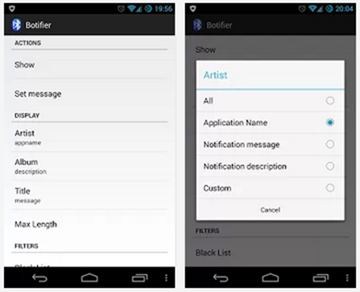 If your smartphone of choice happens to sport a recent version of Android 4.3 only – then you might want to give Botifier a whirl. It’s free, and if you have the required hardware to make it work, then it’s possibly one of the coolest ideas we’ve seen in a while. Dubbed as push notifications for Bluetooth devices, Botifier will send notifications from your smartphone to a device that supports AVRCP 1.3, such as a Bluetooth-enabled car sound system. The result is notifications being pushed to that system with the app name showing as the artist, the summary as the album name and the notification text being displayed as the track title. That text can also be split across multiple track names, too. Users can control the notifications using their sound system’s next/previous track controls to navigate through notifications as well as the play/pause buttons to remove them. The app, created by XDA-Developer forum member Grimpy is completely free and, importantly, open source. If anyone has the means or the interest to fork Botifier they can do so via Grimpy’s Github page.